In my previous review of the coverage bias issue, I compared the many global mean surface temperature (GMST) series that were available to the end of 2014. I demonstrated that five updated full global series showed little evidence of slowdown over 1998-2012 relative to the long-term trend since 1951, although there was a temporary modest slowdown relative to linear trends since 1979. In contrast, the three GMST series assessed in the 2013 IPCC AR5 report (two of which did not account for missing polar regions) collectively showed severe reduction of the 1998-2012 linear trends relative to 1951-2012. Other GMST series based on land temperature stations and sea surface temperatures from ships and buoys are now available and are regularly updated, such as those from the Japanese Meteorological Agency and Berkeley Earth. But the four series listed here have been the most cited and consistently available over the last few years and, just as importantly, present a useful symmetry of data sets and averaging process. As we can see in the table below, the four series form a 2×2 matrix that allows for interesting cross comparisons. The Cowtan and Way series has the same underlying data sets as HadCRUT4 (CRUTEM for land and HadSST3 for oceans), but applies kriging to fill in all missing areas. Thus any differences are wholly due to interpolation; most of these differences can be attributed to inclusion of the full Arctic. 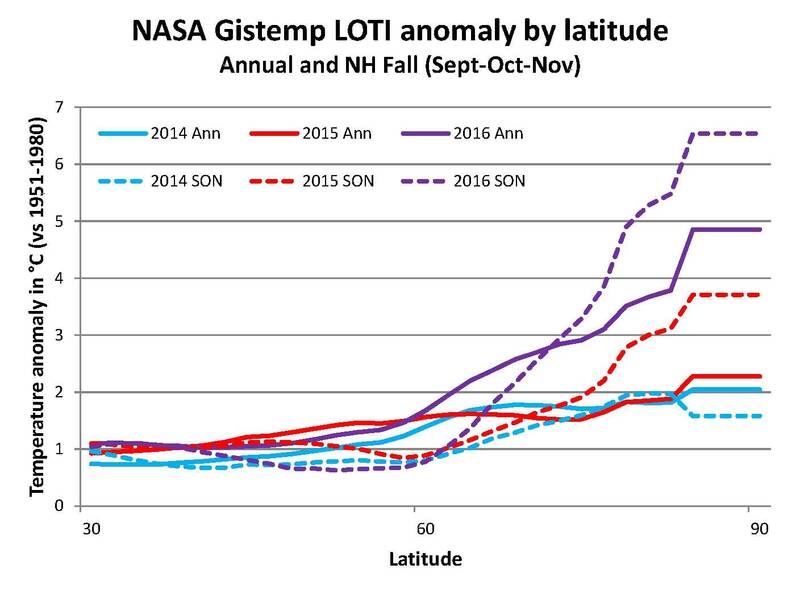 Similarly, NASA GISTEMP is largely based on the same data sets used by NOAA GlobalTemp. In this case, however, the correspondence is not as exact, as NOAA does use spatiotemporal smoothing that fills in some sparse areas, while NASA adds some stations to the GHCN network, notably in the Antarctic. Nevertheless, much of the difference between the two can be attributed to differing treatment of missing areas in the Arctic. Admittedly, a more rigourous analysis would combine available base data sets in all possible configurations, and then apply a set of consistent averaging algorithms to each combination, but that’s a project for another time. The following discussion is based on monthly series rather than annual, but a 12-month rolling average has been applied to bring out the interannual variations around the trends of interest. First let’s take a look at the long term evolution of these series through 2016. 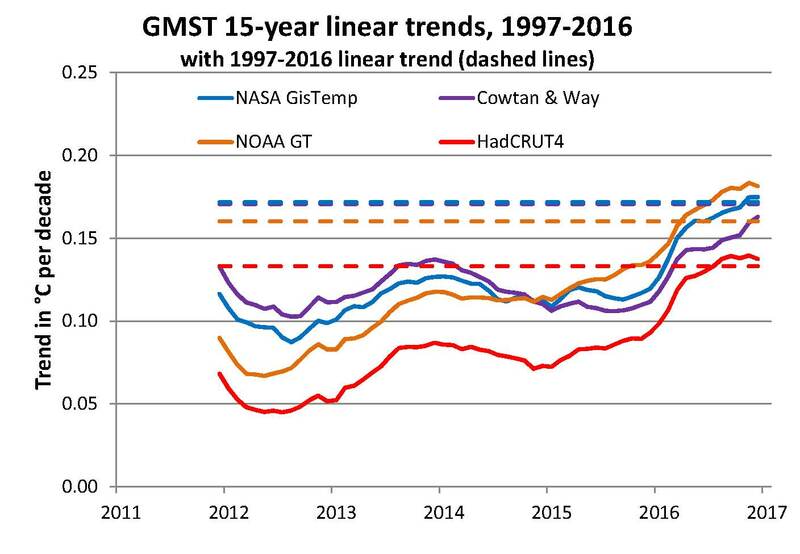 We can see that the long term trend shows a similar steady rise in all four series since about 1980, albeit slightly steeper in the two interpolated series, NASA GISTEMP and Cowtan and Way. Certainly there is no evidence of change in the longer term warming trend in any of these series, as we discussed at length the last time around. A year ago we showed that the same decadal smooth up to 2014 did show a moderate short-term slowdown in the 2000s in all series. All four operational series exhibited this to some extent although HadCRUT4 did slow down more than the others. So three of the four operational series had recent 15-year trends comparable to the long term trend since 1951; HadCRUT4 looks to be a bit of an outlier. Now let’s add the last two years, extending the same decadal smooth through 2016. The early 2000s slowdown is much less apparent and is almost completely hidden by the recent El Nino fueled surge, as all four series rose well above temperatures in the last super El Nino in 1997-1998. The evolution of GMST during this period is also interesting: from 1998 to about 2010 or so, the two interpolated series pulled ahead somewhat, rising further and further above the 1998 peak in the El Nino years 2005, 2007 and 2010. 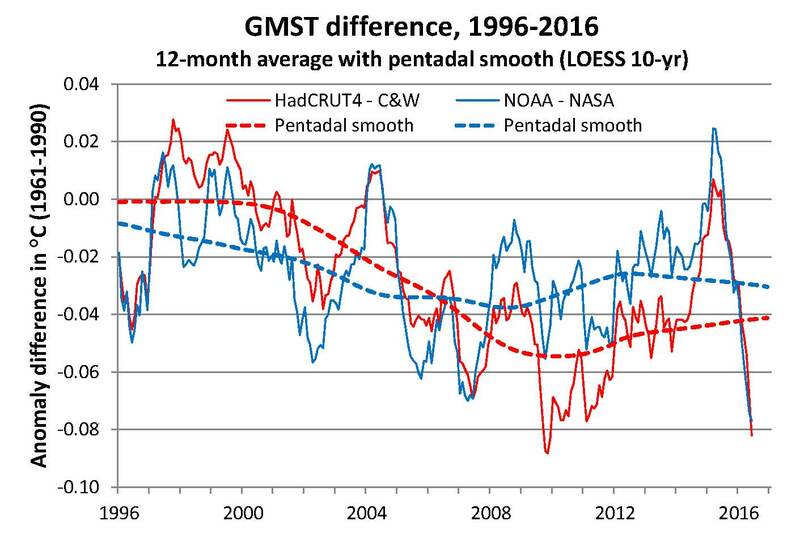 However, the early phase of the recent surge was marked by a convergence between all the series as NOAA and HadCRUT4 caught up (NOAA even surpassed NASA in early 2015). 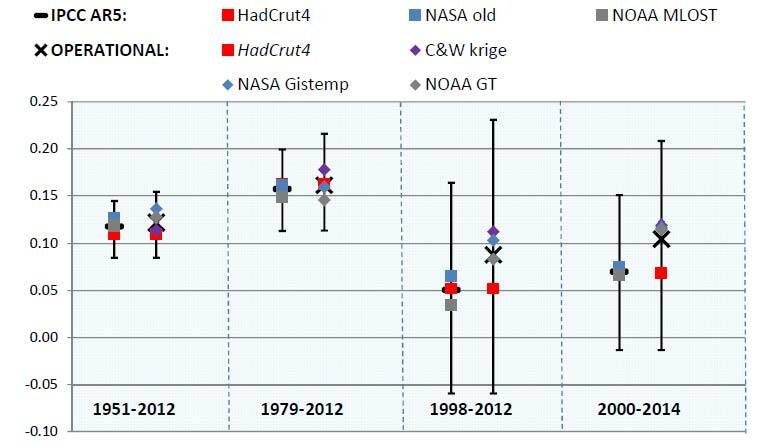 But by the end of 2016, the four series were further apart than ever, with NASA 0.1 deg C above HadCRUT4 (relative to the 1961-1990 baseline). Ocean surfaces have warmed considerably over the last few years, and since oceans cover roughly tw0-thirds of the globe’s area, it is reasonable to examine how sea surface temperature evolution has played into the short-term evolution of GMST. Recall that in 2015, NOAA corrected a cooling bias arising from the failure to account for the changing ship-buoy mix in the ERSST data set. 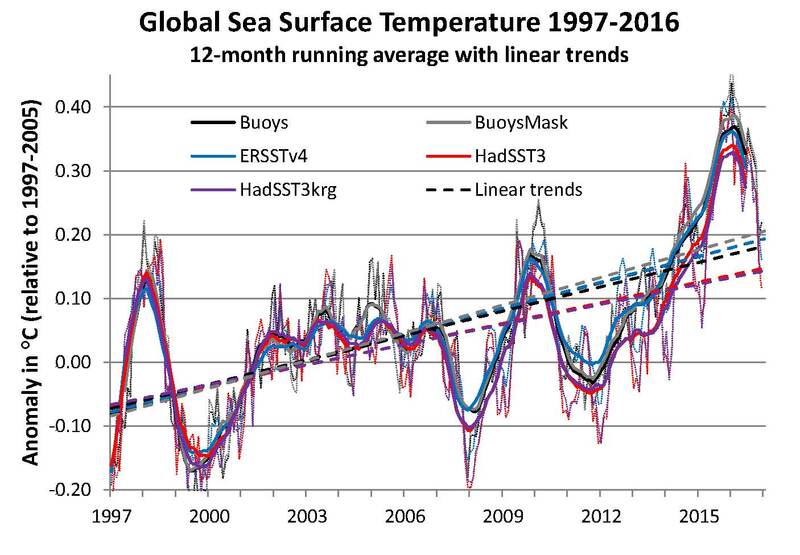 A recent paper by Hausfather et al found that NOAA’s new SST version ERRSTv4 matched sea surface temperatures from buoys (and satellites) quite well from 1997 until present, whereas HadSST3 had an apparent residual cooling bias in the same period. The latest updates through 2016 show that ERSSTv4 and buoys had nearly identical central trend estimates (about 0.14 ºC per decade) over the last twenty years, while HadSST3 had a trend about 0.03 ºC lower. (Full disclosure: I was a co-author of Hausfather et al, my first peer-reviewed scientific publication). 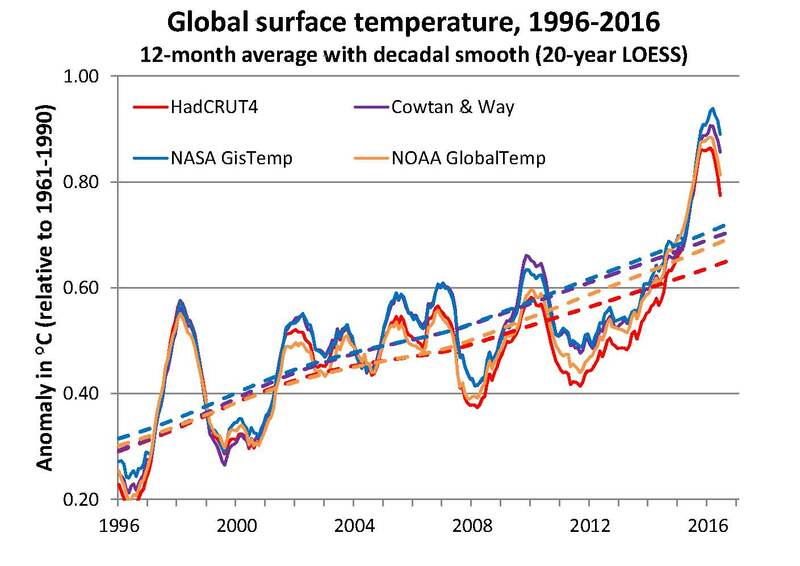 Overall then, differences between the underlying SST data sets probably account for about 0.02 ºC of the difference in decadal linear trend between NOAA and HadCRUT4 over this period (and likewise between NASA and Cowtan & Way). 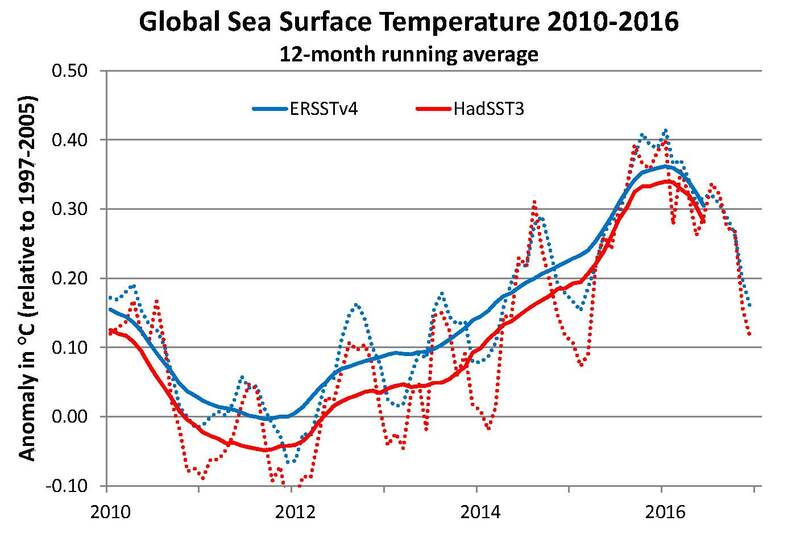 But it’s also interesting to note that the difference between the two SST analyses has narrowed over the last few years, explaining some of the convergence noted above as the HadSST3 based series “caught up” to ERSSTv4. At the same time, the rapidly warming SSTs (combined with somewhat moderated Arctic warming in 2014 and 2015) also narrowed the gap between interpolated and non-interpolated series. 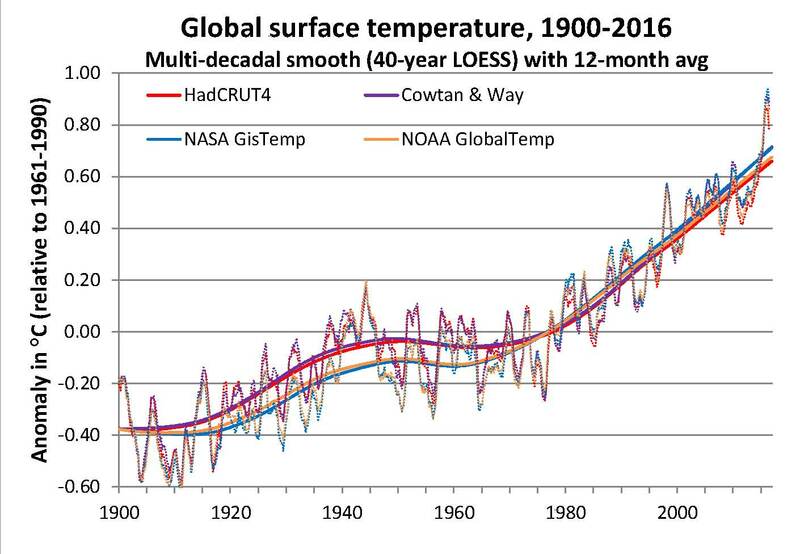 Now let’s look more closely at the difference between the non-interpolated data sets (HadCRUT4 and NOAA GlobalTemp) and their interpolated counterparts (Cowtan & Way and NASA GISTEMP respectively). If we focus on the evolution of differences over the last 20 years, we can see the differences trending down to about 2012, then reversing to 2015. But 2016 saw large divergence again as we have noted, especially at the end of the year. To be sure these differences series are quite noisy, especially the NOAA-NASA difference series, which shows somewhat less coherence than that between HadCRUT4 and Cowtan and Way. Nevertheless, the large dip during 2016 in both difference series is clearly down to rapid Arctic warming, as the following chart showing temperature anomaly by latitude makes very clear. 2016 was very warm indeed in the Arctic, especially in the northern hemisphere autumn (September-November), warmth that continued much of the the 2016-2017 winter. As we have noted, 15 year trends are often used to assess shorter-term fluctuations. The following chart shows the evolving central 15-year linear trend estimates from 1997 to present, starting with 1997-2011 and ending with 2002-2016, comparing those to the 20-year trend over the whole period. As expected, the most recent 15-year trends over 2002-2016 are quite a bit higher than the trough over 1998-2012. But it can also be seen that this statistic distorts short-term fluctuations, as arbitrary selection of end-points creates a disconnect between short-term and longer-term trends. In fact, that the overlapping 15-year linear trends are entirely under the 20-year trend in the two interpolated series. 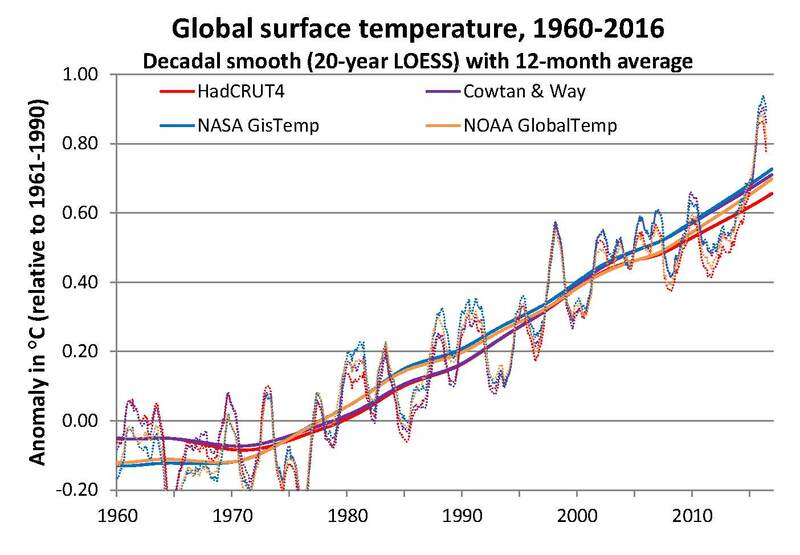 The main point however is that those two series (Cowtan and Way and NASA GISTEMP) continue to run warmer than the two non-interpolated series when evaluated over the full 20-year period. I personally think that both HadCRUT4 and NCEI [NOAA] should start producing a ‘filled’ dataset using the best of the techniques currently available so that we can move on from this particular issue. The results of this study will form an addition to the HadCRUT4 global near-surface temperature data set. The reference to “an addition” seems to indicate that the MetOffice does intend to produce a fully infilled series alongside its established non-interpolated analysis. As for NOAA, it is noteworthy that Karl et al 2015 also produced a full global “polar” series that trended even warmer than the NASA GISTEMP over 1998-2014. So it is entirely plausible that NOAA too will move towards a more optimal global temperature assessment, in the normal course of incorporating ongoing research into its operational products . 2017 is already proving to be an interesting year, as the Arctic winter continues to be unusually warm. There are even early indications that 2017 could end up as warm as 2016, or nearly so, despite the lack of El Nino. Perhaps 2017 will also be the year that climate science does indeed begin to “move on” from the coverage bias issue. Cowtan and Way. Dataset accessed 2017-02-09 at Cowtan and Way overview page. HadCRUT4. Data accessed 2017-02-09 at HadCrut4 data page. NASA GISTEMP. GISTEMP Team, 2017: GISS Surface Temperature Analysis (GISTEMP) . NASA Goddard Institute for Space Studies. Dataset accessed 2017-02-09 at https://data.giss.nasa.gov/gistemp/. 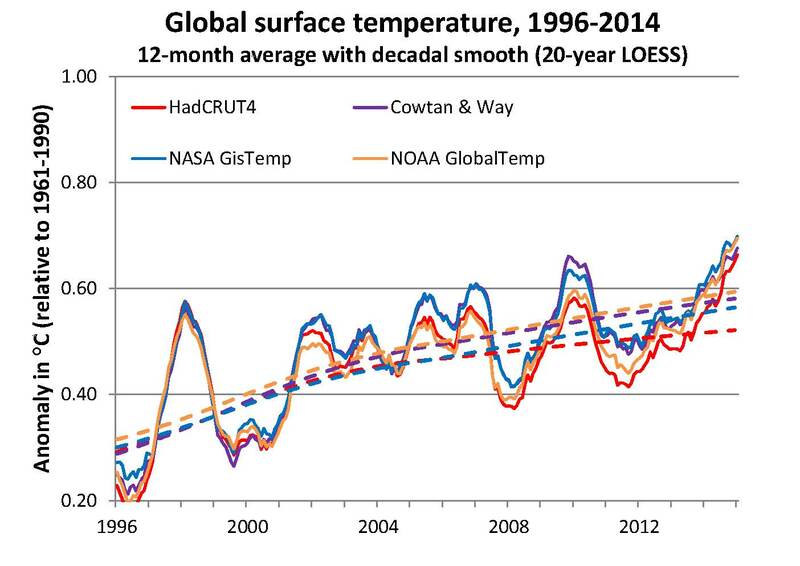 recent global surface warming hiatus, Science, June 4 2015, doi:10.1126/science. Buoy series. Updated dataset accessed 2017-01-12 at Hausfather et al (2017) temperature series page.